Regardless of whether you use your truck for work, construction, or everyday personal use, a bedliner is the perfect investment. These liners provide UV protection and impact resistance, as well as maximum prevention from daily hazards such as scratching, staining, and rust. 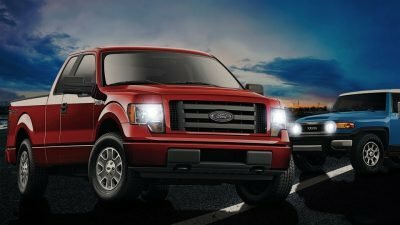 Lakeland Ford dealership, Bartow Ford, offers two options to secure truck beds: spray-in bedliners or drop-in bedliners. Bartow Ford’s Signature Shop can help customers choose a bedliner based on some of the following differentiating factors. A drop-in bedliner is a great choice if you frequently use your vehicle to transport sharp or heavy objects. It covers the bed and tailgate with a thick, durable plastic that protects your bed from dents and dings while loading and unloading cargo; it can also help conceal any previous damage. This is also a great choice if you are considering selling your truck to upgrade to the newest model. You can remove a drop-in bedliner if you want to move it into your new truck, or if the person interested in your car does not want it. 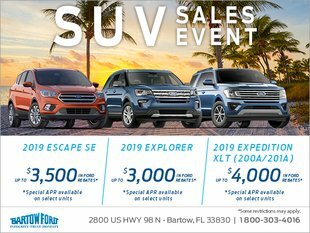 In addition, drop-in bedliners are often less expensive than spray-in bedliners, especially if the customer purchases them from a dealership like Bartow Ford. Bartow Ford uses a hot, high-pressure spray polyurea coating for all spray-in bedliners. This causes the liner to dry to the touch within seconds and allows full, unrestricted use within a few hours. The non-slip texture prevents cargo from shifting around. Spray-in bedliners also have extreme chemical and abrasion resistance, superior impact and compression resistance, excellent color retention, and protect the vehicle from water or moisture damage. Its heavy-duty corrosion-resistant material dampens road noise and vibration. They often last longer than drop-in bedliners as well. If your truck bed often interacts with water or sand, this could be a great option, because this a spray-in bedliner doesn’t have any gaps between itself and the truck for water and sand to get trapped in. Lakeland Ford truck owners can protect their trucks beds with the best at an affordable rate, thanks to Bartow Ford’s Signature Shop.Whether you choose a drop-in or spray-in liner, it’s important to understand the differences and make the right decision to meet your needs.